Our work is often delayed due to storage issues in the devices and it surely is irritating. Sometimes it creates problems when you are trying to install a new application and at other times, it makes your device lag. It also doesn’t allow you to fully update the most accessed applications. This problem is common for iPhone, iPad and iPod users and that’s why they choose some professional tools for massive storage cleanups for their devices. 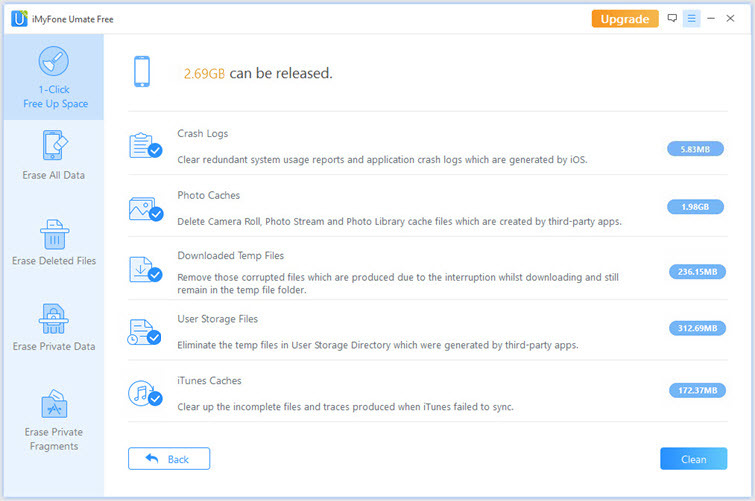 You will find some people preferring Macgo Free iPhone Cleanerfor cleaning up their device’s storage. The main reason behind it is its reliability and performance. However, what is Macgo Free iPhone Cleaner? What is Macgo Free iPhone Cleaner? Macgo Free iPhone Cleaner can efficiently deletes the unwanted files from your iPhone including the junk files, app cache, log files, temporary downloaded files, photo and video cache etc. This will significantly help you as you will have no need of deleting your messages, photos, videos to make free space for other tasks. It will help you keep your useful files and permanently remove only those that are not in use. Macgo Free iPhone Cleaner can clean up junk files and boosts up the performance of your iPhone. However, it has its own disadvantages. It only supports Mac system and it can not clean up temporary files, compress and backup photos and delete large large files. But what if Macgo Free iPhone Cleaner is not meet your requirements? Is there an alternative? Fortunately the answer is yes and the other option is even more powerful than Macgo! The best alternative to Macgo Free iPhone Cleaner is iMyFone Umate for Win/iMyFone Umate for Mac which is a classic choice for storage cleaning. It is highly easy to use and has been designed after intensive research and carefully analyzed technology. 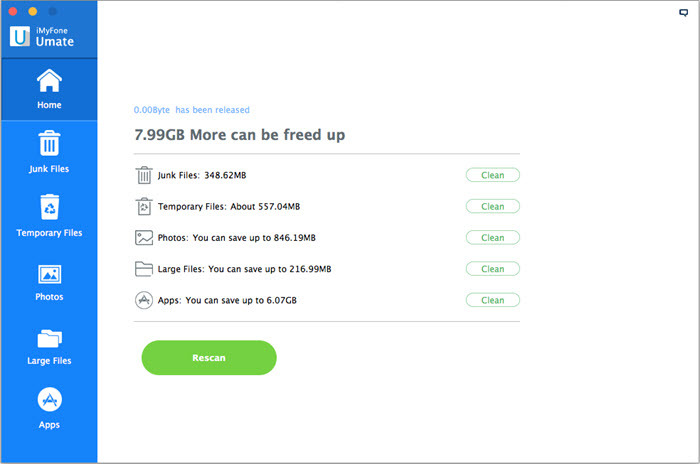 iMyFone Umate makes use of just one click in order to get rid of all the messy temporary files and unwanted junk files, delete large files, compress and backup photos as well. The app also assists in managing your app. Why we choose iMyFone Umate iPhone Cleaner? 1Junk files kill the speed of your iPhone and wastes a lot of time in accessing a simple app. The main reason behind this lag is the accumulation of junk files in a span of time and at this point, it is necessary to have a memory cleaner in your phone. iMyFone Umate has excellent efficiency in cleaning up the unwanted junk files and helps in speeding up the device performance. It can delete temporary files, this feature is remarkable, because many other software don’t support this function. What’s more, iMyFone Umate can increase your storage by compressing photos losslessly and it can delete large files shich is over 5 MB. 2So through one simple click, you can now remove up to 30+ junk files together without the hassle of finding them on your own. This app also automatically backs up the original photographs on the Mac/PC before compressing or deleting them permanently. Its affluence performance allows the retaining of original quality of the images. 3You can also selectively choose files to delete from your iPhone with iMyFone Umate depending on their different sizes. You can also backup these particular files before permanent deletion. 4This app also has a fantastic scan system that allows quick finding of any unwanted or unused apps that are taking lots of space on your phone. It locates them and then selectively deletes them with just one click! 5iMyFone Umate iPhone Cleaner has totally free version. It is iMyFone Umate Free. iMyFone Umate Free is an efficient iPhone Space Cleaner to remove all junk files, delete temporary files, optimize the performance of your iOS devices, and totally for free.